Capability is concerned with characterizing what a process will produce in the future, and readers will learn how to make such predictions with accuracy and confidence. 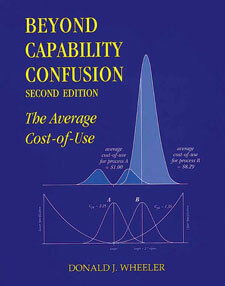 This discussion of capability goes beyond mere computations to illustrate the concepts, the pitfalls, and the appropriate uses of capability indexes for both predictable and unpredictable processes. Examples using data from real-world processes make the ideas clear and easy to grasp. In this popular book Dr. Wheeler has provided practical guidance, based on sound theory, to a perennial problem faced by professionals working in Continual Improvement. and insistence on the basics, it is all very simple. I now get it!